I've not had any stalling though - everything plays nice and smoothly. It seems that any videos imported with 6.0.2 stream, while videos imported (or purchased) with previous versions will not stream. Also, you can now label a video as a TV show, without having to use an something like Lostify. whats that movie yer playing? 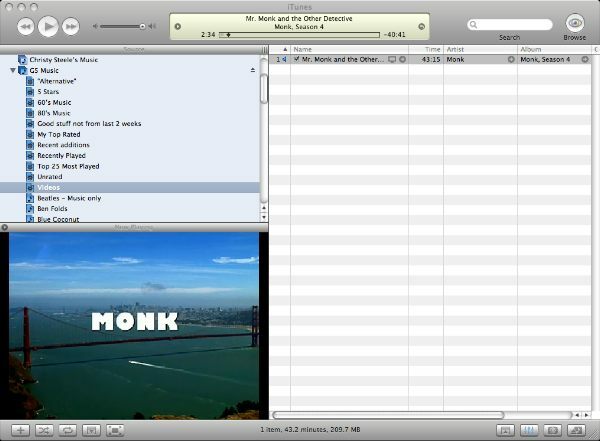 That was a freebie episode of "Monk" that was available last week. this seems to be a half-baked feature. e.g. it's not possible to view a movie full screen. nevertheless, it even works with mt-daapd if you put .mpg in the "extensions" directive of your mt-daapd.conf. at least when you multiplex your videos with "mplex -f 8" when recorded with VDR. Yeah, video podcasts downloaded in 6.0.1 don't show up in the video sharing, but any you download with this version do. That seems like some sort of bug. All you need to do, I've found, is remove them from your library, then re-add them. They'll show up then. Well I just tried this out and am somewhat amazed. At first some video stuff (that I had put in the library pre v602) didnt show up as available, but as hinted somewhere I deleted this from the video library, and then put it back in again usung itunes 602 and all was ok. Sharing worked straight away, and contrary to Igor's experience I could see stuff full screen ok from the client computer (mac or pc). Oh yes and it worked fine cross platform too. I even got acceptable results over wireless from my ibook which only has an old airport card and therefore v limited bandwidth. Some h264 video ripped with handbrake needs to be exported as hinted movie using quicktime pro else it wont run shared. Only fiasco found so far is itunes 602's new ability to export to ipod format (right or ctrl click the video in the library). This is supposed to be able to turn video into format digestable not only by ipod but also itunes video sharing. it works, but i found that the .mov files i processed all got bloated out by a factor of 3.5 ! I later found that the original versions shared ok (dont know if the would work on a video ipod as dont have one), so advise only use this option as a last resort to get stuff shareable. hi I'd like to put some footage online but this video shareing is new to me,could any one tell me how you use itunes to dwnload your footage? It's too slow! I'm trying to make an iTunes video library so we can watch family videos stored on the upstairs computer, but the share is so slow it's not even worth it. Do they have to stream? Do you have to resave them with quicktime as streaming videos? Tnx.